Examples, solutions, videos, and worksheets to help Grade 8 students learn about experimental and theoretical probability. 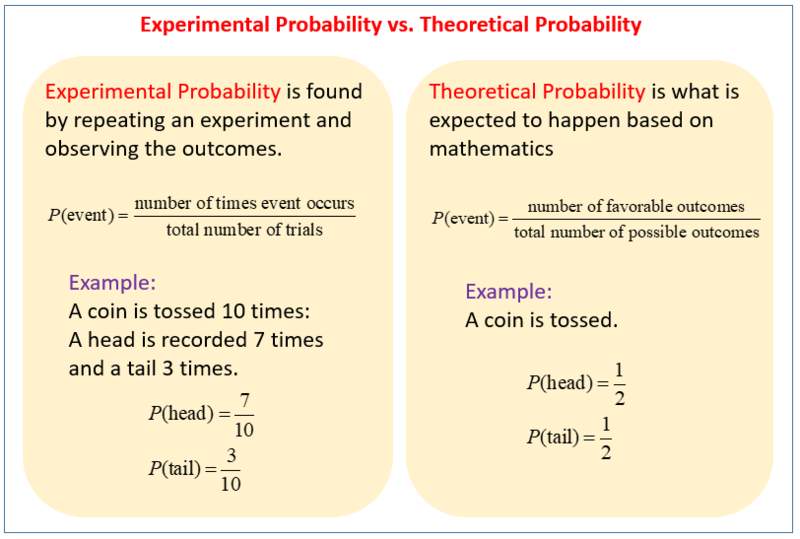 The following table highlights the difference between Experimental Probability and Theoretical Probability. Scroll down the page for more examples and solutions. This video defines and uses both experimental and theoretical probabilities. A player hits the bull's eye on a circular dart board 8 times out of 50. Find the experimental probability that the player hits the bull's eye. 2. Find the theoretical probability of rolling a multiple of 3 with a number cube. 3. Brown is a dominant eye color for human beings. If the father and mother each carry a gene for brown eyes and a gene for blue eyes, what is the probability of their having a child with blue eyes?